This summer, AXN brings to the crowd an energy-packed set of activities that would bring pure excitement to the crowd. AXN Ultimate Thrill 2016 will be held in Camp N Nuvali in Sta. Rosa, Laguna, on April 16, starting at 6 AM. 150 qualified teams of 2 members, 18years old and up, will have to register one to two hours before the event. 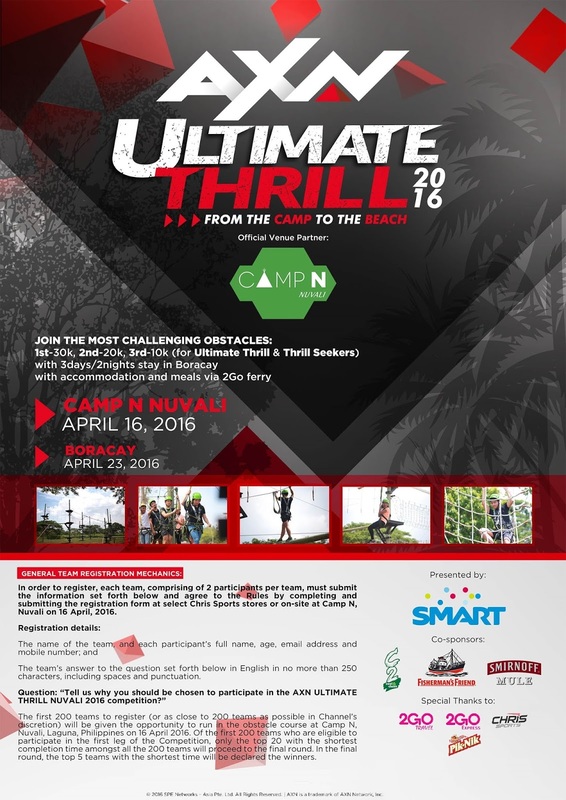 Registration can be done onsite or online at http://nuvali.ph/events/AXN-UltimateThrill-2016 and also at Chris Sports branches. This event presents the thrill-seekers with a variety of obstacles including log hurdles, wall climbing, rollercoaster zipline, and more! After the morning activities, only 20 teams with the shortest time to accomplish the challenges would move on to the final round. Finally, at the end of the event, only 5 brave and tough teams will go on to the next leg of the thrills in Boracay on the following week. AXN Ultimate Thrill 2016 is co-presented by Smart and is sponsored by C2 Cool&Clean, Fisherman’s Friend, and Smirnoff Mule.